Ipoh SOHO is a newly completed shop office home office concept development which is located in the vicinity of Ipoh, Perak. Developed by Kinta Saujana, this soho was completed in the year 2013. This freehold project consists of 3.5 storey of soho units which is suitable for both living and working purposes. Ipoh SOHO offers a total of 24 units which has built-up which sizes begin from 5,702 sf onward. Besides, there are several facilities available within the vicinity which includes business centre, covered parking, private lift and 24-hour security. There are a total of 13 lifts available, whereby each lift is shared between 2 units. A hotel namely MH Hotel is also available in this vicinity which is developed by the same developer and managed by MH Studio. 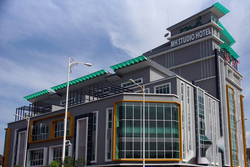 Furthermore, there are numerous amenities in the surrounding of Ipoh SOHO and among them are Ipoh Parade, Green Town Mall, Perak High Court, Ipoh Tourist Information Centre, Perak Tong, Ipoh General Hospital, Ipoh Specialist Hospital (KPJ), Fatimah Hospital, Pantai Putri Hospital, Kinta Medical Centre, Jusco, Tesco, Tesco Extra, Giant, Lost World Of Tambun, Gua Tempurung, Ave Marria School, Dataran Ipoh, Sam Poh Tong, Royal Perak Golf Club, Meru Valley Golf and Country Club and Kellie's Castle. Ipoh SOHO is also linked via highways and roads namely Jalan Sultan Iskandar, Jalan Raja Dihilir, Jalan Raja Dr. Nazrin Shah, Jalan Sultan Idris Shah and North – South Highway. Also accessible in nearby distance are Ipoh KTM Station, Gopeng Bus Station, Kidd Bus Station and Sultan Azlan Shah Airport. Ipoh SOHO was developed by Kinta Saujana, an Ipoh based developer who is in this property development industry for over 20 years. Commenced in the year 1990, this firm had developed other properties namely Villa Gopeng, Taman Heawood, Taman Bukit Medan and Desa Chemor Saujana. This developer also has completed four hotels in the vicinity of Sungai Siput, Kuala Lumpur and 2 in Ipoh, all managed by MH Studio. Ipoh SOHO would be a good place to invest, especially for people who prefer working and staying at the same place to avoid traffic congestions and travelling. This commercial units were launched with the price of RM1,680,000 and currently has a subsale price of RM1,800,000. The monthly rental of this units are between RM4,000 to RM10,000 and currently all units in this development are completely sold out. Looks like we couldn't find any matches. Try search on all Ipoh SOHO ads.